When you have the word “Kraken” in a product, you know that it’s going to be some sort of serious thing. Rightfully so, that’s what we’re presented with as our eyes first feast upon Trident’s Kraken A.M.S. case for the Samsung Galaxy S4. It’s just a beastly looking thing! Sure, it’ll protect it from scratches and whatnot, but going above and beyond over other things, this one actually meets military standard 810F for protection against vibration, dust, sand, rain, and drops. Gone is the streamlined look and lightweight feel of the Galaxy S4, which is now replaced by this ungodly beast of a case. Some people won’t take fancy in its massive size, but sure enough, it does offer peace of mind. 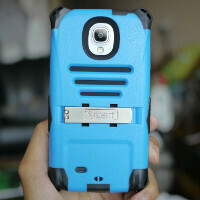 Employing a blue/black color scheme, it’s on the bright side to make it pleasant enough for a ruggedized case. This is covered in layers, enough to give it sound protection from most punishment. Essentially, it’s sporting a tough plastic casing with a front plastic cover to shield the display – while an inner rubbery sleeve gives it the shock absorption it needs to withstand drops. Another cool feature of the Trident Kraken A.M.S. case is the kickstand it’s packing along in the rear, which is held together when it’s not in use. In fact, you’ll need to give it a little bit of tug to unlatch the thing, but once it’s undone, it’ll prop up the handset perfectly in landscape. Out of everything, it’s just so difficult when it comes to putting on/off the case, seeing that there are so many components to its housing. Despite that, once it’s on, you know for sure that the smartphone is going to be soundly protected from everything. At $49.95, the Trident Kraken A.M.S. case for the Samsung Galaxy S4 is priced reasonably – even more when you’re getting something that offers superior all-around protection. Yeah, it turns the skinny looking handset into a Kraken sized thing, but regardless of that, the protection that accompanies the case is unprecedented. I have the Kraken for the S3. It's a great case, though I'm now using the Seidio Active Extended so I can fit an extended battery in it. I like the all hardshell outside of the Kraken, but I want the extended battery, and they don't have an extended case with the Kraken. Yesterday, when I went to bed I had almost 18hrs on battery with 3.5 hours screen on time and I was at 53% battery. so now we can chuck this thing off the burj kalifha and have nothing happen ??? Back is good but front is ugly.